When the going gets tough . . . the tough go on a road trip. Brad Mathias figured his middle child’s moodiness was just a typical teenage thing, until the night God told him to go ask Bethany what she was hiding. Her answer changed their family forever. It wasn’t the first thing they tried, or the only thing, but eventually Mathias decided the best way to heal his family was to pile all five of them in their SUV and head out on a cross-country road trip. He’s careful to point out that God will have a unique plan for every family and his is not a one-size fits all solution. But for the Mathias clan, long hours in cramped quarters, potentially life-threatening weather conditions, and a healthy dose of God’s green Earth was just what the doctor ordered. While it’s full of excellent advice and a pretty good story Road Trip to Redemption suffers from a bit of an identity crisis. It can’t decide if it’s a parenting manual or a memoir and ends up as a slightly awkward blend of both. The author says God advised him to control his impulse to sermonize when talking with his kids; this narrative could have benefited from that advice as well. The flow of the story frequently comes to a screeching halt while Mathias wanders down a spiritual rabbit trail. They’re generally worthy detours—his insights are excellent—but they make the pace feel jerky. The story as a whole could have benefited from more stringent editing. Take the author’s descriptions of his family. He’s clearly a devoted husband and father (a wonderful thing to be!) but the Mathias’ love for his family colors his literary portraits in a sweet but occasionally sappy way. All that mushiness is sweet, but it doesn’t exactly allow for clearheaded characterization; parts of the book read like the proverbial Christmas letter. However, in other areas his writing shines. His dramatic retelling of the moment they learned of Bethany’s issues will hit parents hard. His descriptions of natural beauty will make even a dedicated couch potato long to hit the trail. At the end, Mathias recaps each chapter in a pithy paragraph headed by a parenting principle. A few questions for parents to ponder and discuss would have been helpful to include here. They do exist, but only as a download, whose existence is easily overlooked, tucked as it is in between endnotes and ads at the back of the book. The end matter also includes some useful tips for families planning their own road trip. 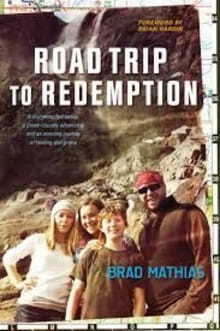 For parents, especially parents of teens, Road Trip to Redemption is definitely worth a read. It may not inspire you to take a road trip, but it just may help you and your family reconnect.